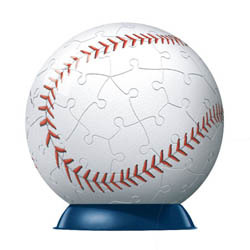 Whether you're a fan of ball sports, of jigsaw puzzles, or both, the sports ball jigsaw puzzles at Puzzle Warehouse will be sure to delight you to no end. The Puzzleball sports series by Ravensburger is a series of ball-shaped puzzles designed to look like the balls from your favorite sports. The 60 pieces puzzleballs, once assembled, form a unique decorative piece with the Ravensburger seal of quality. The pieces, carefully cut with handcrafted tools, fit easily together and there is no glue required to make them stick . Whether you would like a basketball, a baseball or a soccer ball, you can have it an amazingly low price. If you don’t think that all jigsaw puzzles have to be flat, these round-shaped good looking balls are one of the best picks for you. But remember though, a puzzle soccer ball is not a soccer ball, so if you kick it and try to score a goal, you might not like the result. The same goes for the basketball. It won’t make you a good pick for the NBA, but if you’re a fan, you’ll definitely enjoy assembling it and admire the result for the rest of your life. You can even bring it to a game and have your favorite player sign the puzzleball for you. That way, you’ll have an autograph on an item that you created and assembled yourself. If you like the idea, check out the great prices at the Puzzle Warehouse and start your own collection of sports ball jigsaw puzzles.